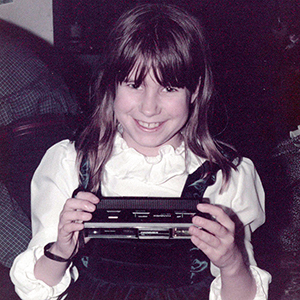 This is me, having just received my first camera from my parents, for my seventh birthday. I just about remember – though I do clearly remember taking photographs with it afterwards, especially of the cat! I still have all my photo albums right back to the beginning, although they are tucked away in the loft and might at some point come to the attention of my husband’s decluttering! But for now, it is comforting to know that they are there: all those holidays, happy moments, and memories of grandparents no longer with us, safely printed out and carefully attached to those sticky pages. Especially as now we’re digital, I don’t print so much, and don’t get around to printing for albums anymore – just the wall! Anyway, at school, I was perhaps an odd mix of Art and History, taking both all the way to A-Level, but there was never any opportunity to learn anything more of photography, and I was jealous of my sister at college who could and did study it! I dithered between these two subjects for a while, but eventually chose history for university (at Leicester, and did mainly Anglo-Saxons, the medieval period, and 16th-17th century France) but with History of Art options (the Victorian era and medieval cathedrals). I then did a year working at home and going back to the creative side, with an A level in Interior Design, but then followed this with an MA in Museum and Heritage Studies (at the Institute of Archaeology at UCL, in London) – there was a module on photographing archaeological artifacts, but I couldn’t fit it into my timetable! Afterwards I ended up working in the picture library at Windsor Castle, selling other people’s photographs of the huge Royal Collection, and found myself wanting to be able to take the photos myself. So I bought my first SLR film camera, found a nearby college and spent a year doing evening classes. I learnt tons on the photography course, which included modules on the history of photography, developing our own black and white film and then printing it, and gaining a thorough grounding in composition and the mechanics of making photographs. I practiced loads too, wandering around Windsor in my lunchtimes and after work, and wherever we went at the weekend and on holiday. At the end of the year I am proud to say I was one of the few in the class to achieve a City & Guilds in Photography. So then from Windsor I found a job using my photography skills and maintaining my history interest by moving up the Thames to the River & Rowing Museum at Henley, and spent a happy 18 months or so digitally photographing the collections for their database. When that came to an end, I did a year photographing fascinating Renaissance books at the British Library, and then spent a few months on a project at the RFU, in the Museum of Rugby at Twickenham – where I learnt all about the 1951 Lions Tour to New Zealand and Australia as I digitised a huge collection of tour memorabilia, and made my husband extremely jealous by holding the Rugby World Cup! 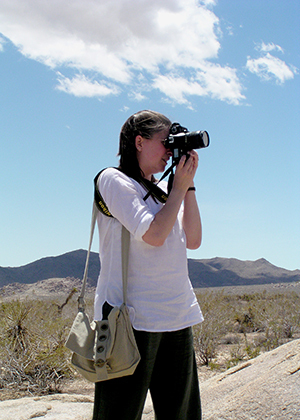 Left – This is me with my SLR film camera, on our honeymoon, at Joshua Tree National Park, California. In 2005 my husband and I took 10 months off work to go travelling, and only then, when we reached Hong Kong, did I buy my first digital SLR, and I have been digital for my own work pretty much ever since. (NB This was first published on my old website Autumn 2016, having been written in notes that summer).